"Omaha loves you most at your CD release party and at your reunion show," said a slightly inebriated Matt Whipkey. Wise words from a guy who's enjoyed the fruits of both occasions with his former band, the alt-country/indie four-piece called The Movies. Now with Anonymous American, a new outfit that plows similar sonic ground, Whipkey and his Movies comrade, bassist Bobby Carrig, are going to try their best to break that tradition. Sitting opposite Carrig and a brown-colored mixed drink at O'Leavers, Whipkey explained how his new band rose both from the ashes of his old band and from his own personal funk. Drummer and Whipkey roommate Wayne Brekke showed up late, while curly red-haired guitarist Corey Weber was off somewhere on the highway selling medical textbooks. It was actually the break-up of two bands that resulted in the birth of Anonymous American. 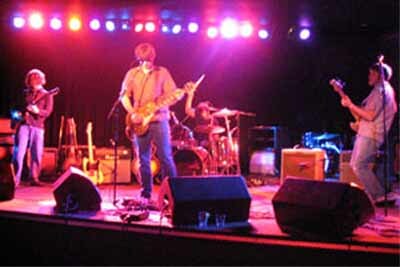 After releasing their well-received debut in early 2002, The Movies lingered for more than a year, gathering a respectable local following, but rarely leaving Omaha for road gigs, thanks in part to drummer Doug Kabourek, who had warned the band when they first formed that he didn't have an appetite for touring. 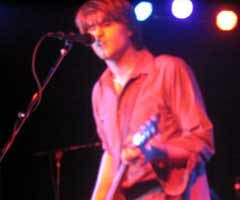 In October 2002, Kabourek finally left the band, giving him more time to focus on his own project, Fizzle Like a Flood. "We were in a lethargic state," said Carrig. "We didn't have anything on the horizon and I was going back to school. I knew (Movies guitarist) Mike Friedman also was frustrated that it wasn't progressing." "Bobby and I were in the string room at Dietz Music where we both work and said, 'Let's call it,'" remembers Whipkey. "I had just broken up with my longtime girlfriend. My grandfather had just died. It was the worst time in my life." Whipkey continued to write songs and play folkie solo acoustic sets through the winter, eventually pulling together material for a recording session booked at Bassline Studios for March 2003. All he needed was a band. He would find one at, of all things, a reunion show at the now defunct Music Box for The Get, a straight-up rock outfit that featured Weber, his brother, Chris, and Brekke. Sitting in on bass for the set was Carrig. Shortly thereafter, Carrig and Weber were jamming with Whipkey. "When I found out Corey was playing with those guys, I assaulted Matt and said 'You must have me as your drummer,'" Brekke said. "I had learned the whole Movies record and dug their vibe." The band would gel at a series of frenetic rehearsals for the Bassline sessions, whose recordings were the beginning of Anonymous American's debut CD. "Matt plays the same way at rehearsals as he does live," Brekke said. "When he gets animated, it gets me just as animated behind the drums. For once, going to rehearsals was fun." "I think I scared Corey at those first rehearsals," Whipkey said, "and I still do. The best shows The Movies every played were rehearsals that no one's ever seen." Anonymous American's sound falls into a genre uncomfortably referred to as Americana, a hybrid of country and rock. Look up the word in the All Music Guide and you'll find bands listed like The Jayhawks, The Pontiac Brothers, Whiskeytown and John Hiatt. Add the obvious Bruce Springsteen nuances along with a healthy dose of Let It Bleed-era Stones and a touch of Gram Parsons and you'll begin to understand where Anonymous American is coming from. I call it classic American bar rock music (honky-tonk if they only had a keyboard) played for pure yee-haw enjoyment of the masses. The new ensemble is less country-esque than The Movies without Friedman's pedal steel, though there's still plenty of twang to go around, not the least of which is in Whipkey's hound-dog vocals and Weber's peaceful, easy feelin' guitar solos reminiscent of Joe Walsh. "I had just broken up with my longtime girlfriend. My grandfather had just died. It was the worst time in my life." "Other drummers are like, 'Why do you let him stand on your drums?' Because it's so rock and roll." The sound is captured in the band's debut full-length, the self-released When the Drummer Counts to Four, but not the stage spectacle. Whipkey's live presentation is sheer bravado, kicking and whooping and comfortably prancing off stage to get closer to an audience that's slightly afraid that they might get hit by a his flinging guitar. It's that energy that makes Anonymous American one of the most endearing and well-received live bands on Omaha stages these days. "Matt broke my front drum rim because he kept standing on it," Brekke said. "I had to put a reinforcement around it. Other drummers are like, 'Why do you let him stand on your drums?' Because it's so rock and roll. We know we're not playing the best we can sometimes, but we don't care because we're having such a good time." "I get that kind of stuff about Matt's over-the-top antics all the time," Carrig said, laughing. "He gives everything he has for every show. You never know what'll happen. Matt went face-first into my bass a couple months ago. That's something you can't plan." A huge Springsteen fan, Whipkey says he's emulating The Boss when he's on stage. "No one has put on a better show than Springsteen. He's transcendent." At the same time, Whipkey also credits local musicians Simon Joyner and Conor Oberst for inspiring him to try performing in the first place. "Watching them gave you a sense that you didn't have to be proficient vocally or musically to get on stage; you just needed to feel it in your heart. I knew I could do it, too, if I had the heart and a few chords." As a band that's ready and willing to tour, Whipkey and Co. say there's nothing holding them back this time 'round. And for Whipkey, there's no other place he'd rather be than on stage. "I love the crowds," he said after the rest of the band had headed to another bar for last call, leaving him there to sober up before he going home. "You feed off the people from stage. When the drummer counts to four it starts off the most beautiful mess in the world. I'll never get tired of that." Published in The Omaha Reader March 31, 2004. Copyright � 2004 Tim McMahan. All rights reserved.